Cairo Steps founder Basem Darwisch, and his German-Egyptian musical ensemble and Ali El-Helbawy band, will play a concert at his home governorate of Minya at the University Hall on 19 December, as part of "an initiative to spread the beauty of arts and music in Upper Egypt." The initiative was first introduced by the Bani Mazar-born Darwisch to Egypt's Culture Minister Ines Abdel-Dayem during the Sharm El-Sheikh Youth Forum in November. Minister Abdel-Dayem, who has been frequently featured on the flute with the German Jazz Award winners, commissioned the organising of the initiative's first event. Darwisch is expected to be accompanied during the event by many Minya-born public figures, as an expression of unity in the face of the recent extremist attacks against Christians in the governorate. "It's a dream came true. I always wanted to organise an elegant art event in my homeland and to reach as many youngsters as possible," said Cairo Steps boss Darwisch, who moved to Germany years ago. "After performing a lot in Cairo, Alexandria and Damanhour over the past three years, I found that the time has finally come to go to Upper Egypt and introduce an unfamiliar music concert there." "We were brought up on the values of brotherhood between Muslims and Christians, sharing all hobbies together without any discrimination. We lived the best years of our lives despite the rise of extremist groups in the 1970s and 80s and their failed attempts to dominate art activities at schools," Darwisch said. "After long years of working abroad and exploring many different cultures, I believe that music unites nations more than anything else today. This is what I want to achieve with my countrymen," Darwisch added. Founded in 2002, Cairo Steps is known for mixing classical music with jazz and Oriental Sufi tunes; they have also introduced a successful project at Cairo's Opera House called 'Al-Moled Wal-Milad,' in which they fused Coptic gospel songs with Islamic chants. 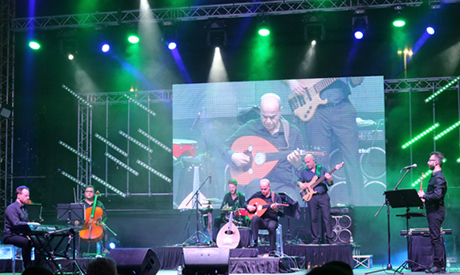 The Minya concert comes as part of an active season for Cairo Steps, who played two concerts in the Arabian Gulf for the first time - in Kuwait and the UAE respectively. Cairo Steps is playing at the Alexandria Opera House on Thursday, in Damanhour's on Friday, and in Cairo's on Sunday, three days before the Minya concert. They will accompany HOH, which comprises Hany Adel of Wust El Balad, Ousso Lotfy of Nagham Masry, and Massar Egbari's Hany El-Dakkak in a concert on Thursday in New Cairo. Cairo Steps, conducted by Sebastian Müller-Schrobsdorff and frequently featuring Islamic chanter Ihab Yunis, were co-awarded the German Jazz Award in Berlin in April alongside German band Quadro Nuevo for their joint album Flying Carpet.